Hamilton, as medium sized city in Netherlands. In the Netherlands there are about 17 medium-size cities with between 100,000 and 250,000 inhabitants. Comparing Hamilton NZ to medium sized cities in the Netherlands, Hamilton is one of the most medium of medium sized cities. Even Hamilton’s 14-89m elevation would not be out of place: Enschede is sited on land 42m above sea level, with a hill reaching 85m above sea level within 10 km of its centre, and the hills around Nijmegen and Arnhem are in the order of 50-80 metres. Arnhem itself is sited 14m above sea level, with a hill reaching 110m above sea level within 10 km of its centre. 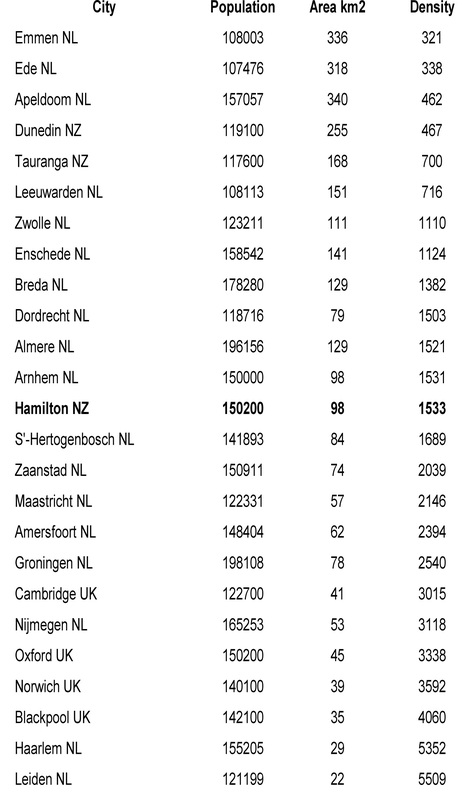 In addition, its 100 km distance to Holland’s leading large city, Amsterdam (and only 115km to Rotterdam) is similar to Hamilton’s 125 km distance to New Zealand’s leading city, Auckland. All medium-size cities invest in themselves differently. Could density be the most limiting factor in a city’s economic growth, wealth and health – should we encourage people to work and live closer together? Peter, do you have any demographic information for comparable cities in Netherlands and/or UK? It’d be interesting to be able to compare factors like GDP per capita, life expectancy, transport modeshares, etc. There are some UK cities on list, The one that most closely matches Hamilton over the last 50 years is Cambridge UK, It is also moving to safer speed streets. How about some demographics of the populations of these comparable cities? Are they richer, happier, better looking than us? 😉 Are their houses more or less expensive? How much do they spend on transport? Then we could perhaps draw some conclusions as to whether the way they’ve developed has been successful. If we look closer at Hamilton, we can find areas with different levels of population density through out the city. Let us say about a quarter of the Dutch cycle to work, regard less of density, Climate and hills. Let guess that it reduces there household spending on transport by maybe 2%? In Hamilton we choose not to cycle at the same leave as the Dutch. We choose not to have this free money available for the local economy. Is Dunedin’s population being divided by its TLA area to get density? Dunedin city is relatively compact, but there is a large rural area within the TLA boundaries. I suspect dividing the population by what people would consider to be the city limits would yield significantly greater density numbers. I suspect it’s difficult to compare the political units between different countries and sometimes even between different localities within the same country. The Netherlands is a very small country by land area so I would expect it’s town and city boundaries to be a closer match to urban limits than you get in many parts of NZ. I have used Wikipedia Dunedin page for the table above, I had a look at Dunedin council Web site where it says “Population – 123,000 (student population 25,000). Dunedin is New Zealand largest city by area” There is no reference to area, so have no number to workout density. I have also visited a number of these. My thinking is that at a human level, there are many different types of cities in NL (some comparable to parts of Hamilton). I would suggest this comes from city state type of history, more than small country label.